Have you ever seen people kayaking and thought ”that looks fun”? Do you have access to lakes or rivers near where you live? Have you been paddling for a long time but never practiced wet exits, rescues or received any formal instruction? Are you looking for something fun and adventurous to share with children, a partner, siblings, co-workers? Do you love exploring and getting out in nature? Sea kayaking offers a lifetime of learning, exploration and adventure, and immersion and intimacy in nature to be taken to whatever level you choose. Weekend courses offered for beginner and intermediate paddlers of all ages. Classes will form per demand. The first day will entail specific skills instruction, rescues and theory. The second day will build upon the first and offer a day trip to utilize and expand the previous day's skill session. Fundamentals Training and Tuning. Learn new, practice or augment existing skills with certified (ACA) instructors. 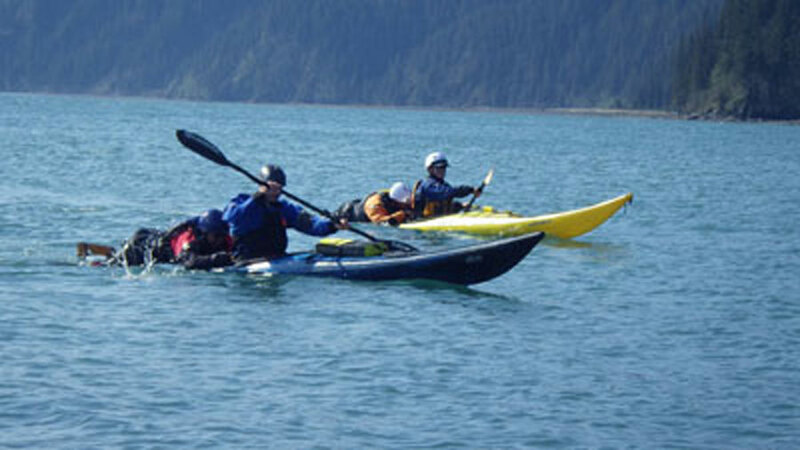 We will offer coaching on safety features and design of kayaks and kayaking equipment. You will be fit to a kayak to maximize performance. The coaching syllabus includes wet exits, ruddering and paddling without a rudder, turning and spinning the kayak, back paddling, stopping,moving sideways, edging, balance and bracing, and solo and assisted rescues. Coaching will be focused per individuals’ goals and experience. 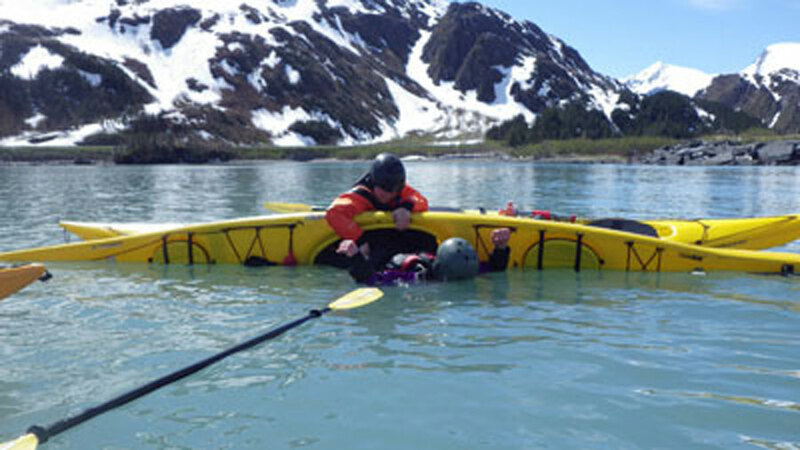 All equipment can be provided including: sea kayak, paddle, skirt, PFD, dry suit, and more. You provide your own clothing, food, water, and other necessities. An equipment list will be sent upon registration. Whittier can be accessed by car through a one-way toll tunnel ($13 for cars). Inbound openings are on the half hour, for fifteen minutes. First inbound opening is at 6:30 AM, and the last inbound opening is at 10:30 PM. Outbound openings are on the hour, for fifteen minutes. First outbound opening is 6 AM, and the last outbound opening is at 10 PM. There are some mid-day variations to this schedule, to accommodate rail traffic. Please call us to discuss this schedule, if planning a mid-day entrance. Allow 1 hour and 15 minutes to drive from Anchorage to the tunnel entrance. Click here to see the summer tunnel schedule. 2. A change of clothes for the end of the day. 3. Lunch and snacks for each day. 1. Kayak, paddle, PFD, spray skirt, deck gear. 2. Dry suit and booties. 3. Helmet, balaclava (neoprene hood), neoprene gloves. 4. Dry bags as needed. 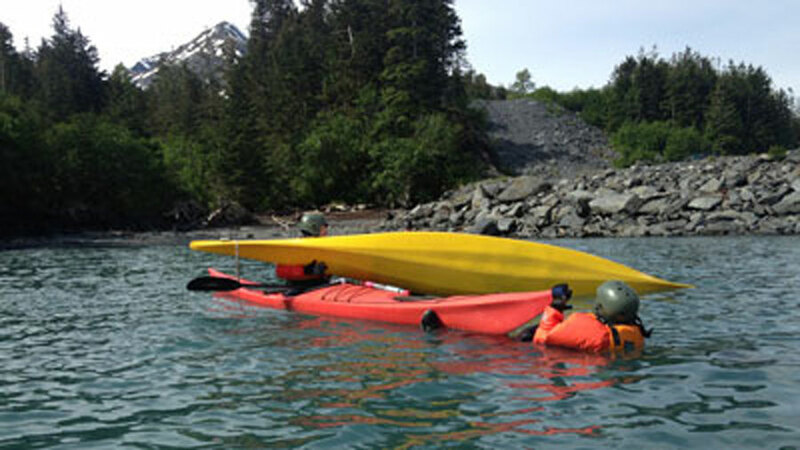 Alaska Sea Kayakers offers instruction to the public through the certified instructors of The British Canoe Union and the American Canoe Association. 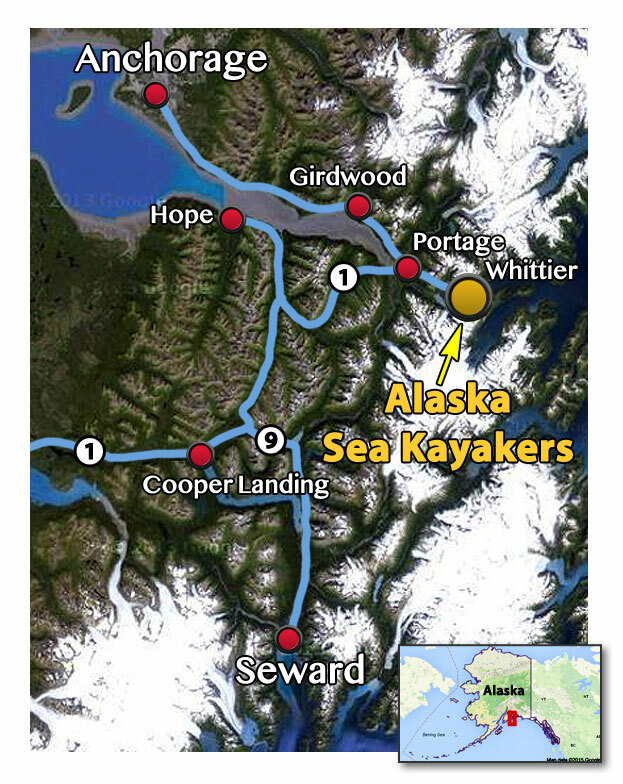 Novice and beginning paddlers should receive instruction in paddling skills, group and self-rescues, and develop an awareness of sea conditions before presuming to paddle Alaska's coastal waters. Instruction will be offered by British Canoe Union and American Canoe Association instructors. Our instruction sessions will be held, following the ACA syllabus. Cost will be $350 for a two day session. The first day only is available for $200. Attending both days is strongly recommended. Instructional sessions will require a minimum of five students, not to exceed ten students. All gear is included; kayak, paddle, skirt, drysuit, helmet, booties, gloves, and hood. Participants should bring; rain gear, layers of insulating clothing (fleece, capilene, polypropylene), a change of clothing for the end of the day, food for shore lunch, and a bottle for water. Throughout both days we will incorporate theory and scenarios to challenge you in a safe and conducive learning environment. Other instructional dates, custom and private sessions are available based on interest.